It has been a while. I moved from Washington State to Kansas to "center" myself, as I am still traveling across the United States. I just completed 3 new designs and am working on a lot more. Having a home makes this so much easier then traveling from hotel to hotel. 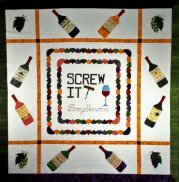 "Quilter's Wine A Lot" - this is a fun, whimsical quilter's quilt. You can find it on the website in under "Embroidery Patterns" and "Machine Applique' Patterns". 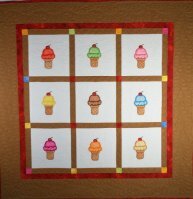 "Ice Cream Social" - can be found in under, "Embroidery Patterns". Colored Pencils. 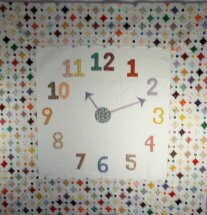 "Back In Time" - can be found in under, "Machine Applique' Patterns". Cathedral Window Border. Please check out my website at www.unseenhands.net and do not hesitate to contact me anytime with any questions you may have.